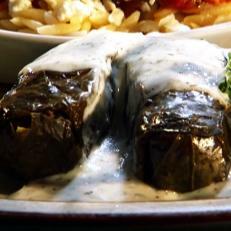 Chef Lakis Kazakos converted his auto repair shop into a Greek taverna and is now serving up his mom's recipes. Guy could not get enough of the keftethes, which are lamb sliders flavored with mint and parsley. The saganaki, fried cheese, was also "off the hook." Locals enjoy the lamb gyro the most.